Ohalo manages your data privacy risk. Real-time data discovery, classification, and entity search for your modern organization. Get started in seconds. Keep your data discovery and mapping up to date over time. Find data about your customers, clients, and employees in no time. To start using the Data X-Ray, you just need to connect a datasource that you want to scan and map. Supports both structured datasources like SQL or unstructured datasources like Windows file systems. The Data X-Ray automatically classifies your data according to your organization’s needs so you know where personal and commercially sensitive data is stored. The machine learning algorithms save thousands of person-hours spent detecting data relevant to your policies and taxonomies. Searching for people or legal entities in massive and complex data landscapes can take months. The Data X-Ray does this in minutes. Search features allow you to easily define entity characteristics and vastly reduce false positives to get the data you need to fulfill data privacy regulation obligations. Machine learning to inventory and control data across your organization. 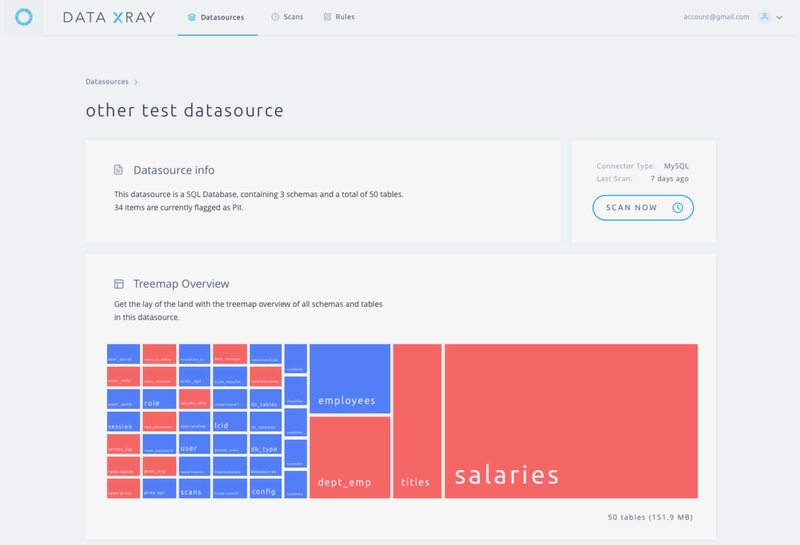 Easily add new classes of data to the machine learning algorithms without a team of data scientists. Non-technical end users can easily employ these algorithms to scan structured and unstructured data in any language to find data that may be sensitive to your organization, such as personal data, employee records, and commercially sensitive data. Employees can inadvertently copy data into insecure locations from databases to excel spreadsheets and forget about it. The Data X-Ray finds data that is sensitive to your enterprise and flags it for remediation. Clients and partners need to trust you to properly take care of their data. The beautiful Data X-Ray UI allows you to show and report on your performance over time to clients and partners. You can export these reports into a PDF or easily integrate to third party workflow and business intelligence tools through the API. "It was integrated in seconds. It was a great help to take those first steps towards GDPR readiness and ongoing compliance"
"In just one scan, the Data X-Ray Cloud saved us $10,000 in mapping our data instead of evaluating it ourselves. Better yet, it keeps up to date over time as our data changes." "The technology and capability that Ohalo brought to the table created an opportunity to find a way to make the connections between all of our data more effective and more streamlined for our partners and customers."